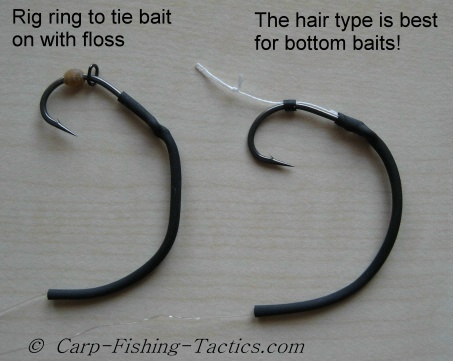 There are 2 basic ways to make a withy pool rig, the first one uses a rig ring that can slide along the shank of the hook. The second uses a hair rig that is attached to the shank using a small piece of silicon tubing. For me, the best way to create the withy pool carp rig is the second one in the photo below, one that uses the silicon tube. 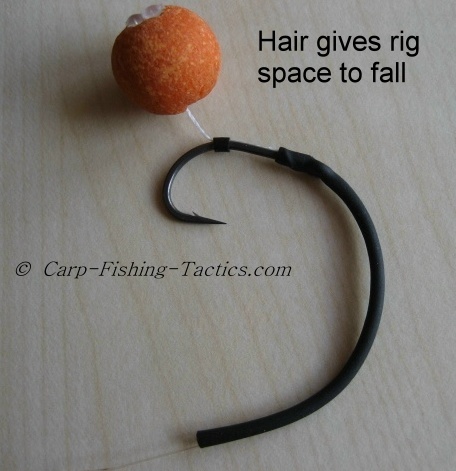 I have found this way allows a bottom bait to rest and present much better on the bed when using this type of rig setup. 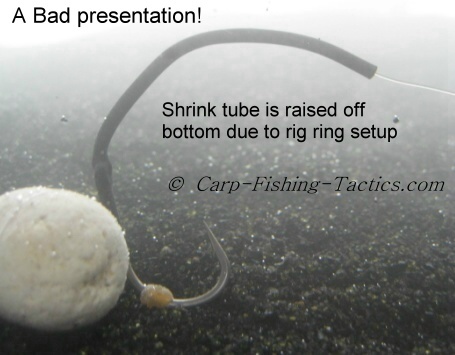 The rig ring setup, causes the boilie to sit too close to the shank, this sometimes pulls the hook into a different angle and it may cause the tubing to spring up off the bottom giving a bad bait presentation. You can see how it affects the presentation of a bottom bait in the photo below. 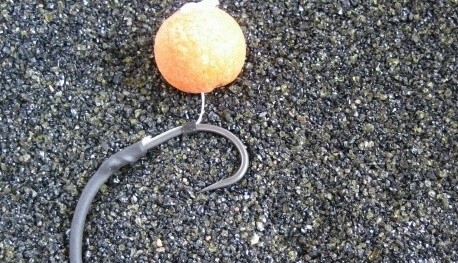 The hair rigged version of the withy pool gives the boilie space to fall away from the hook shank. 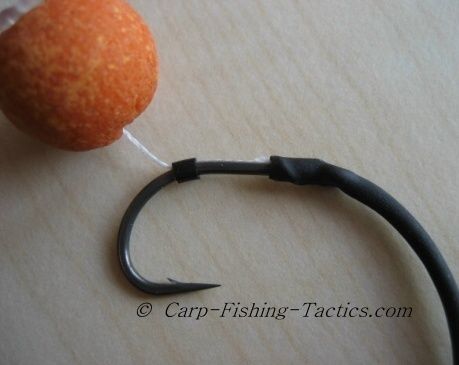 This lets the hook and tubing fall as they should for a much better bottom boilie presentation. The whole fishing rig now lies flat on the bottom. 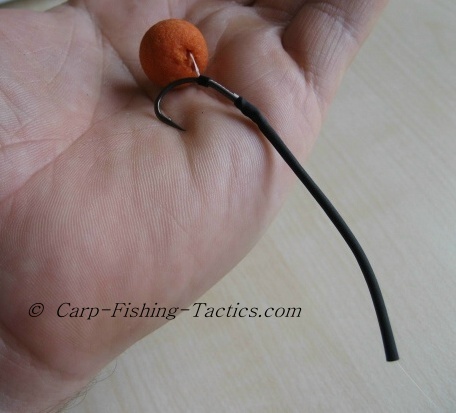 The photos below show how I test the hooking efficiency of the withy rig on the palm of my hand. I have found through experience that a loose coil of the shrink tubing helps the hook turn and grab a hold much faster than a tight coil withy rig. 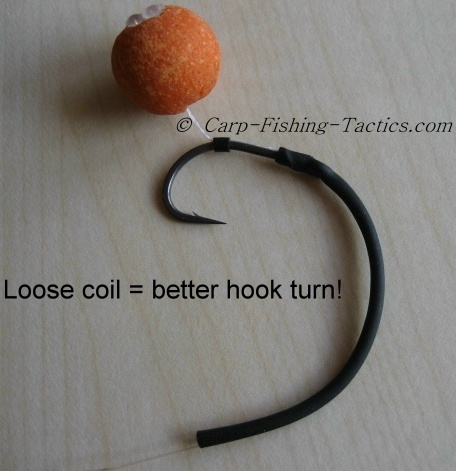 I have seen numerous ways to create the withy pool rig, but although they may look good, I think some set ups wont have very efficient hooking capabilities. 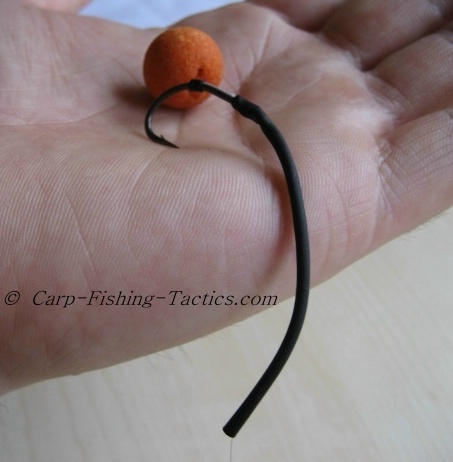 Check out different styles of Withy Pool Carp Rigs Here! Some people believe that a tight coil is needed so the whole section can fit into a carp's mouth. However, I believe that it's only the first, hook end section that will enter the mouth, and this will be sufficient for hooking the fish. It doesn't matter if a carp approaches from a different direction, the bait and hook will turn and still enter the mouth correctly simple because the withy has a good ability to turn quickly. 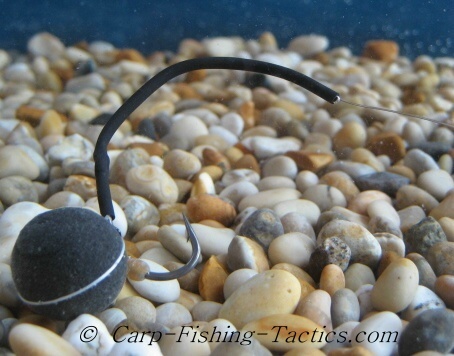 Withy pool rigs can catch carp if set up correctly! 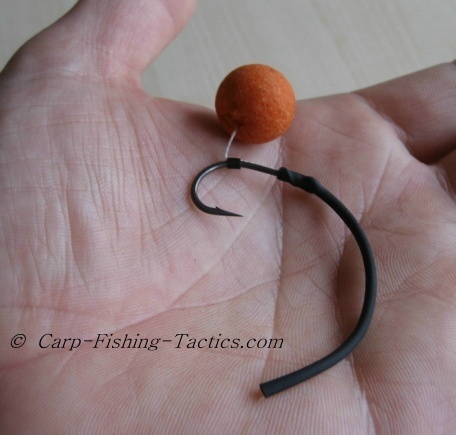 Look at other ways to make the withy pool carp rig click the link below! !